3.141592653. . . . .
Pi is a pretty cool mathematical constant. A number that, in all likelihood, continues on forever and ever, containing all possible numerical combinations imaginable. It is this number that allows us to find, among other things, the circumference of a circle. I have to admit, I find the concept of pi fascinating. And, when I think about the concept of pi, my attention is quickly drawn to an even more fascinating God. A God who created the entire universe, setting in place mathematical formulas and scientific principles to govern the physical world, yet He Himself can not be defined by any mathematical formula or scientific principle. A God who is all-knowing, ever-present, all powerful, yet He still loves me and knows me by name. He knows every detail of my life . . . and He still loves me. To Him, I am more than just a number . . . I am His special creation, His masterpiece, His child. So this year, when pi day comes along, I will focus on the amazing God who created pi. And here are some ways that you can help your child do the same. 1. Remember that God is eternal. This means that God has no beginning and no end. This seems impossible to many of us, and it is hard to get our minds around this fact. However, scientists would agree that pi goes on indefinitely, and most likely, forever. If a number that is used as a mathematical standard can have no ending, certainly a God who created that mathematical standard can have no ending AND no beginning. He has always been. Activity: Read Psalm 93:2. Then draw a circle on a piece of paper (or find something that is in the shape of a circle). If you have older kids, you might choose to have them draw their own circle, then find the radius, diameter and circumference. Then have them try to locate the starting point of this circle. If it is a perfectly drawn circle, this will be difficult, if not impossible. Use this to have a discussion about how there is no beginning for God. No matter how hard we look, we will not be able to find God’s starting point. God has always been, and always will be. 2. We are more than a number to God – He loves us individually. I had heard that every possible numerical combination could be found in pi, and it makes sense. If a number continues on forever, it would stand to reason that every single combination would be present. But then I decided to search for numbers important to me. I found my phone number, not once, but 25 times in the first 200 million digits of pi. Then I searched for my birthday. That number is only there 18 times. My anniversary is there 25 times and my zipcode occurs 1,965 times. And that’s just in the first 200 million digits!!! It is easy to feel small and insignificant when reduced down to a numerical sequence – especially when that sequence appears so often. But that’s NOT the way it is with God. God knows MY name. He can single me out INDIVIDUALLY, and there is no one else exactly like me anywhere in the universe. Activity: Search for numerical combinations that are important to you and your child. Try your phone number, birthday, zipcode, etc. (Find them really quickly here: http://www.angio.net/pi/piquery) Then read Psalm 139. Isn’t it great that God knows your NAME? You are not a number to Him! Help your child make an acrostic poem of his name, using personality traits or something special about him for each letter. 3. Pi might give meaning to a circle, but God gives meaning to our lives. I’m not a mathematician, so I can’t really go into all the reasons for wanting to know the circumference of a circle and all those other really important facts that pi allows you to find. I can imagine, however, how terribly exciting the discovery of pi must have been for those people who really were frantically searching for mathematical meanings. Pi answered a lot of questions for them and gave them a standard that is still used today. In the same way, God is our unchanging standard, giving meaning and purpose to our lives. When someone discovers God for the first time and enters into a relationship with Jesus Christ, his life becomes full of purpose and hope. Activity: Give your child a problem to solve, but don’t give him all the needed information. When he begins to get frustrated, discuss how it is impossible to find the answers without all the correct information. This is similar to how scientists and mathematicians must have felt when searching for answers without the understanding of pi. Then give your child the needed information and let him solve the problem. Discuss how this can relate to our need for God. We can never get all the answers correct in our lives until we have an unchanging standard – a living, loving God. 1. John 3:14. Draw a snake or make a snake craft together. Divide the snake into three segments and then draw or write ways that Jesus fulfilled this verse in each segment. 2. Philippians 3:14. Make an obstacle course with your child. Have a well established finish line. Race with your child (or time your child as he runs) through the obstacle course. Reward him greatly when he finishes. Talk about how this is like life. We have many obstacles in our lives, but we must keep going to reach our goal! (To tie this in more with pi, make your obstacle course in the shape of a circle). 3. Colossians 3:14. Use magnets to experience with bonding. What types of items will bond to your magnet? Is there a size limit to bonding? Have fun trying all sorts of experiments. Then discuss how love is suppose to be the bond that draws us all together in unity. How does this happen? Draw a circle or use a paper plate to have your child draw ways that he can love those around him. 4. 1 Peter 3:14. Research the reactions to some of the early mathematical/scientific theories. Did people always believe that a number such as pi existed? Were the early researchers ridiculed for their theories? Then discuss how some people have the same reaction to Christianity. You might be teased, ridiculed, or persecuted for your beliefs, but you need to remain strong and cling to Jesus. Discuss ways to do this. Spend time praying for the courage to stand for Christ, even in the difficult times. Do you have any other ideas for ways to use pi as a springboard for Biblical truths? I’d love to hear them! And, if you enjoyed these ideas, please share this article with your friends! Pi day of the Century!!! What a fun post! You are so creative, Cheri. I’ll remember this. Looking forward to celebrating Pi Day now. What a neat post, it’s to PI over! 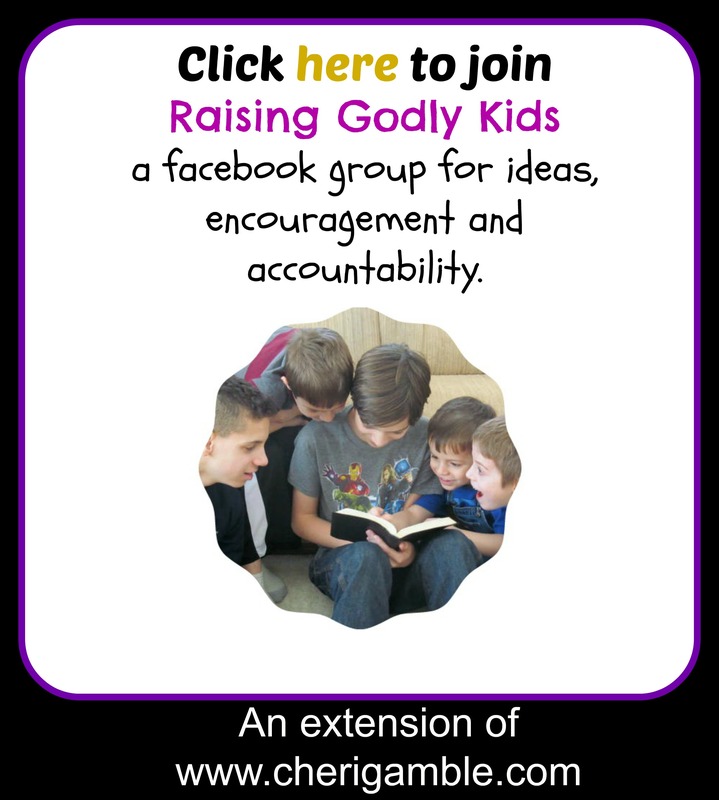 :) Love how you share how to point our children to Christ through this rare day. We know a young couple getting married this Saturday because of the special date! What fun ideas!! I love Pi day and the bible is rich with mathematics which we should be pointing out to our children. Thanks for sharing these, I was kind of stumped as how to explain it to my kids! Love this!! We were just informed that Middle School is celebrating pi day on Monday (with food of course, augh…) What a great way to set aside some special activities for the kids this upcoming week! Thanks. What a unique way of explaining the bible to children. One thing you said that I really liked is “a God who created the mathematical standard has no beginning and no end.” Now that hits the nail on the head of His power! This was so interesting! The Pi lovers in my house will get a kick out of this! Love how you wrote a blog from this! Dear friends of mine are getting married on Pi Day. Blessings! What creative ideas for Pi day!! This is great! Thank you! This is great, Cheri. I just heard on the radio today that tomorrow is pi day, but they didn’t take it down to the minute and seconds like you did. What a great analogy to teach our kids. I love this. Brilliant! Love the lesson! And of course, don’t forget to bake a pie tomorrow 😉 At least, enjoy a slice after completing these activities with your family! This is the first thing I have read on your blog, but as soon as I saw it I said, this lady homeschools! 🙂 I love it, you are the kind of homeschooling mom I aspire to be, so creative with your lessons. I will be using this with my kids tomorrow. This is a great post! Sharing with my prayer group. Cheri, I love your creativity…and it’s so on point. I’m sharing it with my kids-they’ll love it too. How fun and well thought out. Loved it. 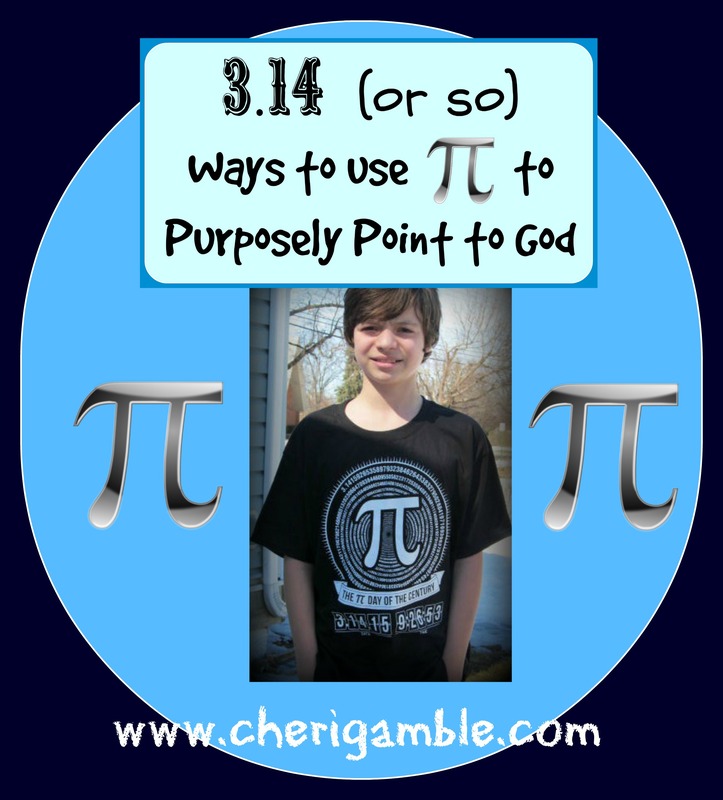 Such a creative way to point kids to God every day, including pi day. Today is #ApproximationDay, 7/22 or 22/7 (~3.14). I absolutely love this and will share it today!! Thanks for your patience and thoughtfulness, Cheri! !